For start out businesses and SMEs, the prospect of your first face-to-face marketing experience can be a scary one. But is planning an event, exhibition or fayre really that frightening? 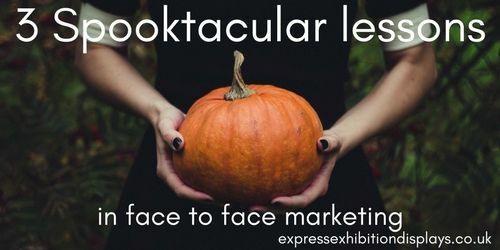 With Halloween drawing closer, we’ve put together our top 3 marketing tips for face to face events – making your exhibition experience a little less trick and a lot more treat. 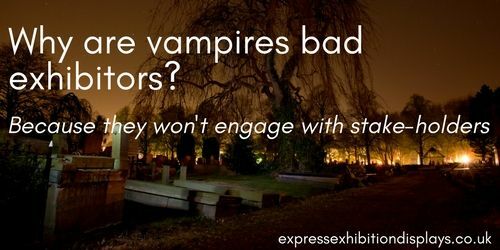 Trick: Why are Vampires bad exhibitors? Because they won’t engage with stake-holders. Treat: When exhibiting at any event, it’s important to make sure that you are engaging with your audience. After all, you’re not going to get any Halloween sweets if you don’t ring the doorbell! This isn’t just about saying hello to visitors to create a welcoming environment for your stand, but also about how to have useful conversation. If you start talking to a visitor, then there are a few tools that can help you to determine whether they are interested in your products or services, or whether you should close the conversation to move onto another potential customer in a polite way. The trick is to ask tailored questions to learn more about your visitor and whether their needs match what you’re offering – for example, a service provider may ask whether they currently use their type of service. If this question sparks interest in the visitor, then it’s likely that you should move onto your next question to determine if they are a potential lead or not. These questions will be unique to your business, but will help gauge how to move the conversation on. 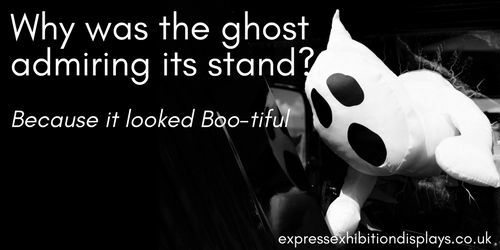 Trick: Why was the ghost admiring its stand? Because it looked Boo-tiful! Treat: Having an engaging looking stand is not just about how nice your stand and marketing materials look. It’s important to remember that you are representing your brand and you don’t want to be turning potential customers away by what you’re wearing or how you’re acting. So whether it’s a Halloween costume, a business suit or a branded t-shirt, make sure that whatever you’re wearing matches the look that you want to portray. To pull out all the stops on-stand, remember that this also includes behaving right, so banish those mobile phones and bored faces as you’re putting on a show that shouldn’t frighten passers-by! 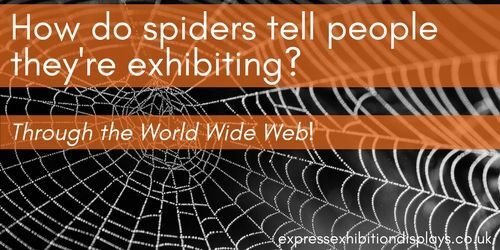 Trick: How do spiders tell people they’re exhibiting? Through the World Wide Web! Treat: Don’t forget to tell people that you’re going to the event, exhibition or fayre. Take advantage of social media, email marketing and your website to let people know where they can find you and what may be in it for them – are you launching a new product, Christmas range out, or giving something special away? 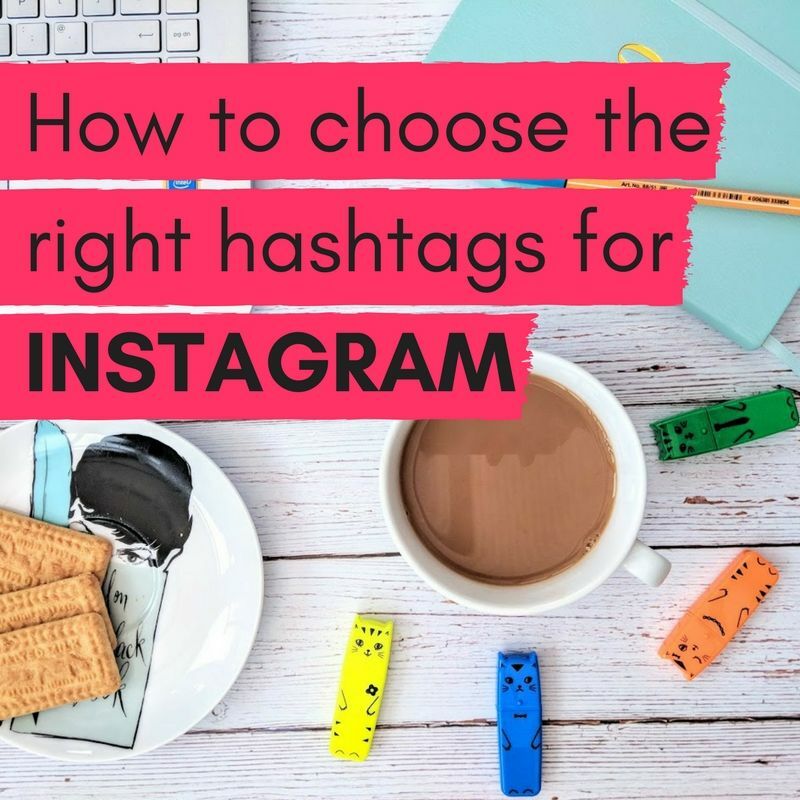 Telling people that you’re going not only allows your loyal followers to see you in action, but it also provides extra opportunity for people who don’t know about your brand to find out about you and give them a reason to stop by. Sad that this article is over?